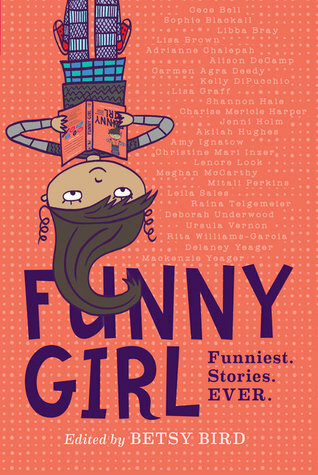 Sharyn Novbember at Viking has acquired Funny Girl, a humor anthology for girls ages 9-12, curated by Betsy Bird and featuring short stories, personal essays, comics, and poetry from nearly 30 female writers, including Lisa Graff, Cece Bell, Jenni Holm, Shannon Hale, and Rita Williams-Garcia. A portion of the proceeds will support WriteGirl, a creative writing and mentoring organization for teen girls. As with most short story collections that I've read, the quality of the stories varied. I enjoyed some of the stories a lot more than others. Some I found rather odd such as A Most Serious Recitation of the Poem "Trees" by Joyce Kilmer, Rendered Most Seriously (and with the utmost care) By The Hand of Cece Bell with a pasted in picture of Benjamin Franklin debating with a pig, amusing but really odd. There were several stories that were quite informative (sort of) such as How to Tell a Joke by Delaney Yeager and Mackenzie Yeager or Brown Girl Pop Quiz: All of the Above by Mitali Perkins. My favorite stories were In Which Young Raina Learns a Lesson by Raina Telgemeier, which revolves around young Raina's unfortunate (but hilarious) encounter with a bee. Also, Dear Grandpa: Give Me Money by Allison DeCamp and One Hot Mess by Carmen Agra Deedy left me with sore ribs from laughing so hard. In the Dear Grandpa story, a young girl writes letters to her grandpa demanding money and her grandfather writes back. In One Hot Mess, a young Cuban American girl explains why her mother always sets the tub on fire when they move into a new place. A couple of stories may concern some adults/young readers because of the topics, but are funny because of the truth they contain. The first such story is Over and Out by Lisa Graff which revolves around Riley's attempts to rescue her sister's fancy bra from a toilet tragedy which could result in her demise. A Public Service Announcement About Your Period from Sarah T. Wrigley, Age 12 3/4 by Libby Bray presents the advice of a young person about getting one's period which is irreverent but funny. Other stories include a brief appearance from Babymouse (Jennifer Holm and Matthew Holm) as well as an amusing presentation of the Chinese Zodiac. Some stories cover only a couple of pages, others a dozen pages. The stories also vary in presentation, with most of the stories being regular prose, but others being in comic format, and still others combining text and illustration. I think what I enjoyed most about the book was the clear message that girls can be funny and let their senses of humor shine. I just added it to the list to check out for my daughter. Thanks for the heads up!